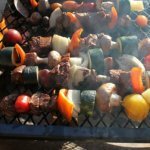 Campfire beef kebabs are pretty much the perfect camping food. There isn’t much in the way of prep work and you can cook them directly over a fire. Meat on a stick is also a no brainer. The challenge is that an overly small cut of meat can easily dry out over a fire, and an overly large cut of meat will cook far slower than the vegetables. Cutting to the wrong size will either leave you with raw meat or burnt vegetables. The key to getting this deceptively simple looking dish right is in the marinade and how you cut up your ingredients. This step should be done the night before you head out. Marinading the meat overnight will make more tender the next day. Just don’t marinade any longer than that (really, ten to twelve hours would be sufficient). The acid in the lime will actually cook your meat if left too long. You don’t want beef ceviche. 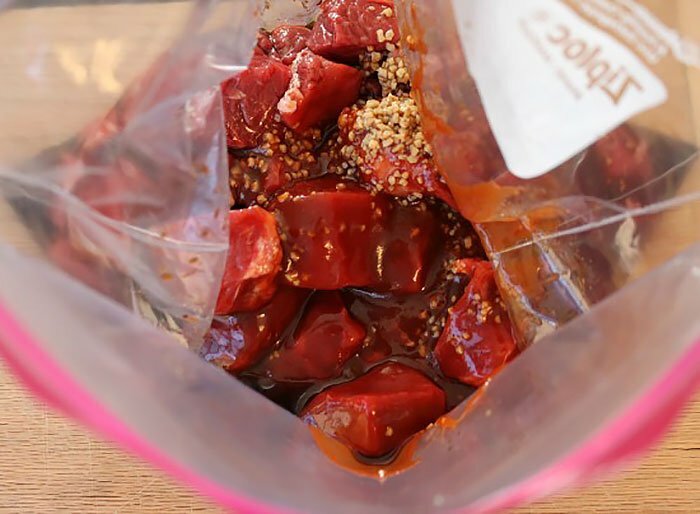 First, take all of your marinade ingredients and dump them into a gallon resealable bag or plastic container. Seal it up and mix it well. Next, take your beef and cut it into one inch to one a half inch chunks. Your meat chunks should be cut smaller than the rest of your ingredients. The key to making great kebabs is how you cut everything. Smaller cuts cook faster than larger cuts, so the densest ingredient should be the smallest, with the least dense being the largest. That way everything finishes cooking at about the same time. Now, toss your meat in the marinade, seal up your container, making sure that all of the meat is generously coated. 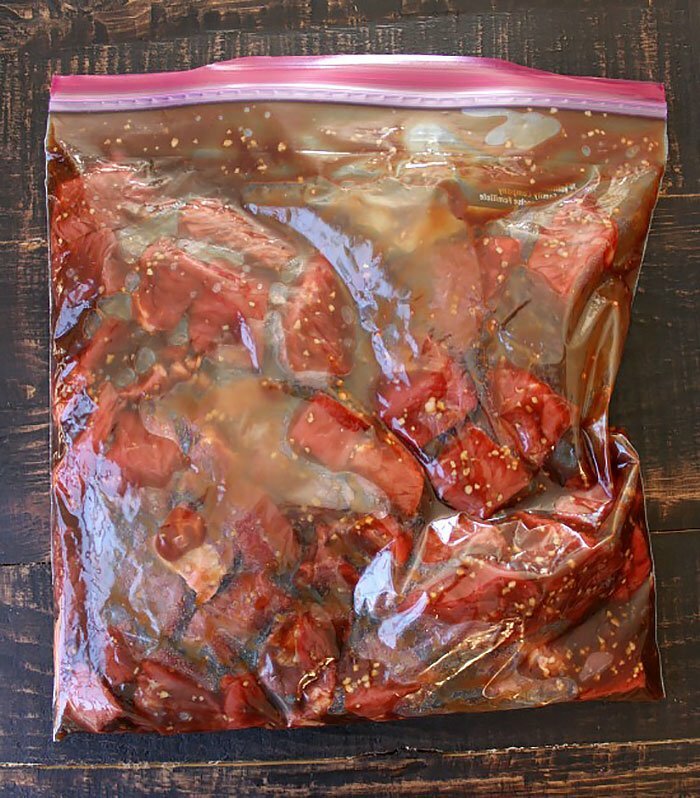 Toss your marinade container in the fridge until you’re ready to pack up your ice chest for your trip. 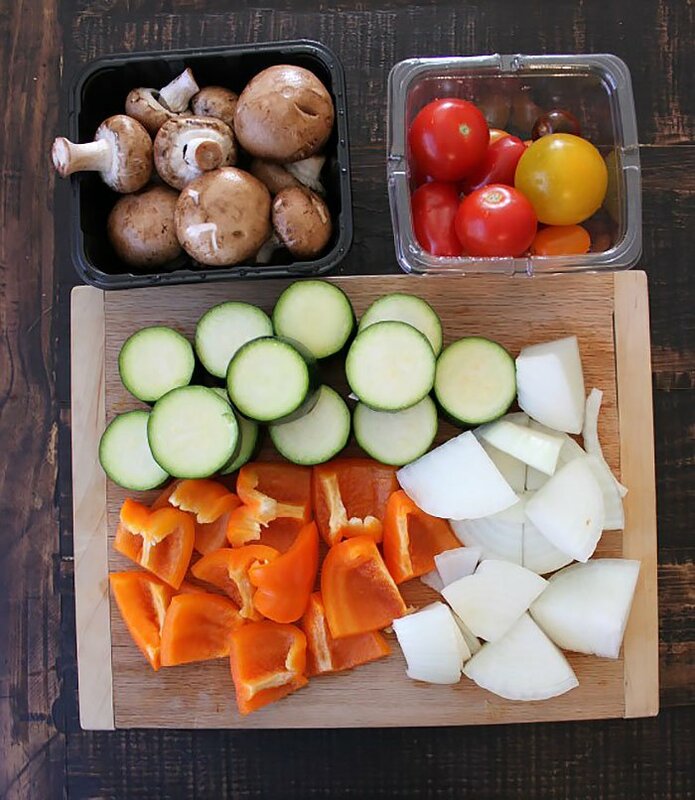 Wash all of your vegetables then chop your zucchini, onions and peppers and toss them into another plastic container. You might prefer bagging your onions up separately so that the rest of your vegetables don’t smell when you take them out the next day. Toss them in your fridge with your cubed meat to be packed into your ice chest in the morning. Once you’re at the campsite and you’re getting close to being ready to start cooking, go ahead get your fire going. Remember, you don’t want to cook over a roaring fire. You’ll want to give it time to die down to a good bed of coals before you start cooking. 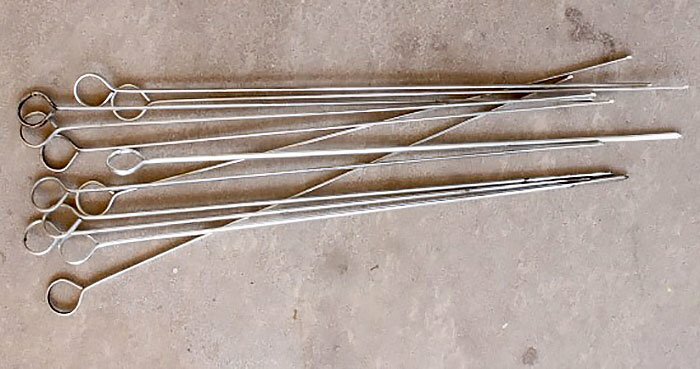 As your fire is dying down, you can start assembling your skewers. This step is easy enough. Its a great time to get the kids involved and direct operations while you get into the adult beverage ice chest. Once all of your skewers are assembled and your fire has died down, spread your coals out into a two inch thick bed and put your grill grate over it. 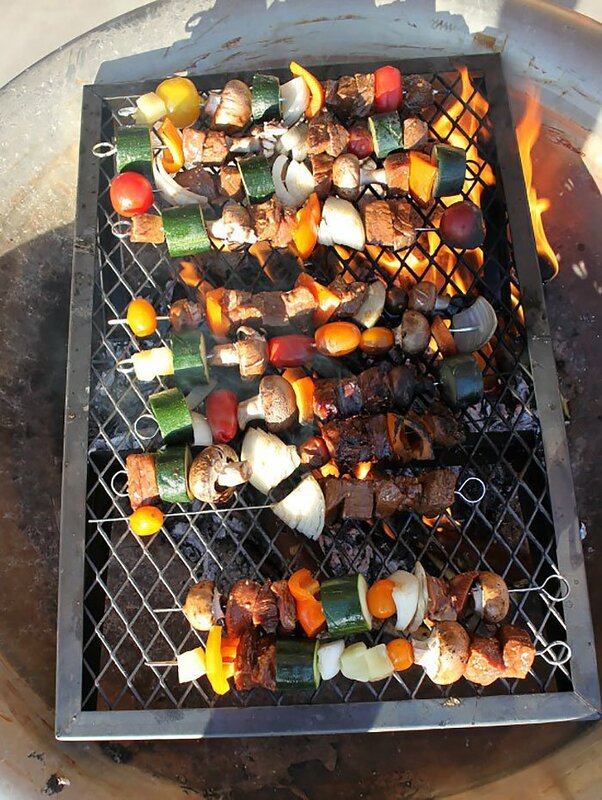 The closer you can get your grate to the coals the better your kebabs will cook. Let your grate get good and hot before you throw on your skewers. 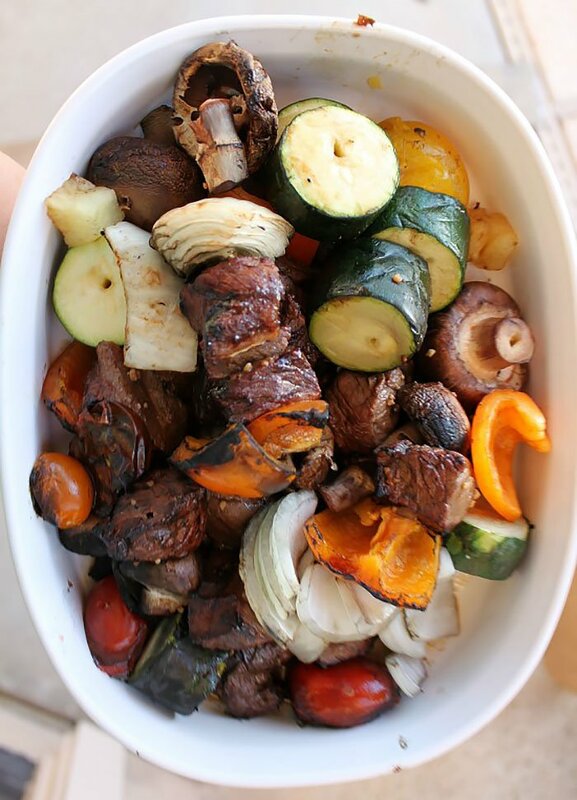 Toss your skewers on the grate. You can see in some of the pictures that the fire hadn’t quite burned down enough and there was a little bit of a flame. Be careful that you don’t leave the skewers over a fire like that. They’ll end up burned. Let them cook about 3 to 5 minutes, then flip them over (make sure you’re using your tongs or gloves or you’ll end up with roasted fingers) and cook them for another 3 to 5 minutes. Cooking times can vary quite a bit due to the heat of your coals, the proximity of your grate to your heat source, how cold it is outside, and how windy it is. 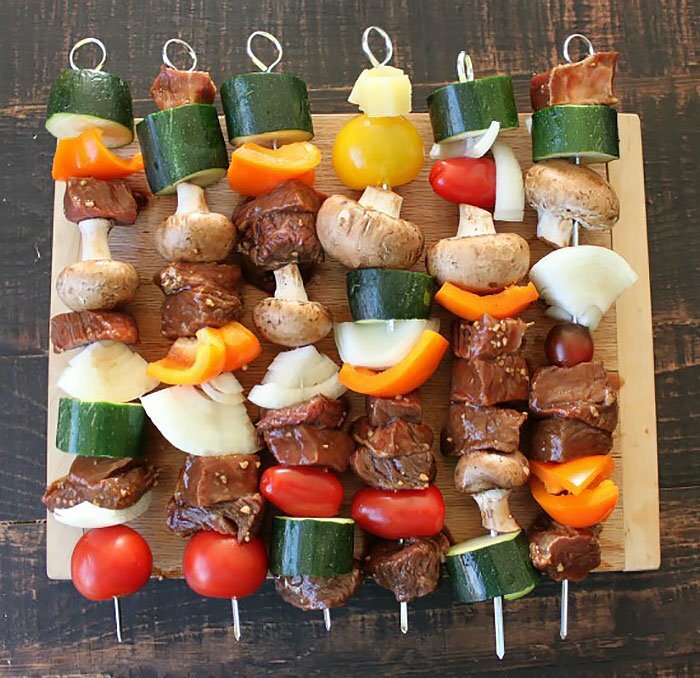 To test to see if your kebabs are done, pull a piece of the meat off of one of the skewers and cut it open slightly. If it’s not ready yet, simply slide it back onto the skewer and cook it until it is. Add all marinade ingredients to large plastic container. Mix well. 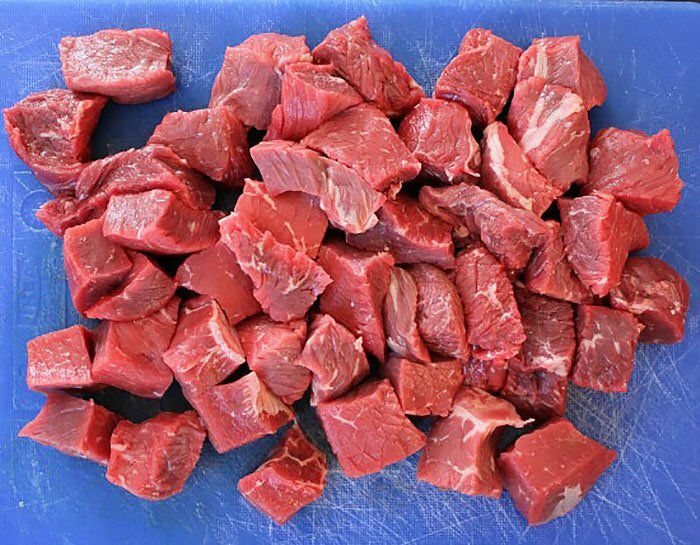 Cut beef into 1" to 1 1/2" cubes. Toss into the marinade. Mix well, ensuring the beef is well coated. Chop the onion, zucchini, and pepper into large chunks. Throw vegetables into large resealable bags (onion in separate bag). Let your fire burn down to a bed of coals. Then spread coals out into a two inch thick layer. Put your grill grate over your coals and let heat up. 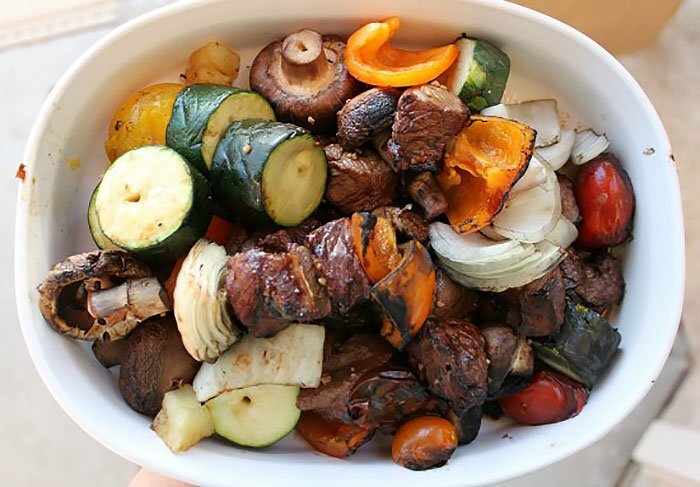 Assemble your skewers, alternating each ingredient. (its helpful to put a chunk of meat on the very end to make it easy to get to so you can test doneness). 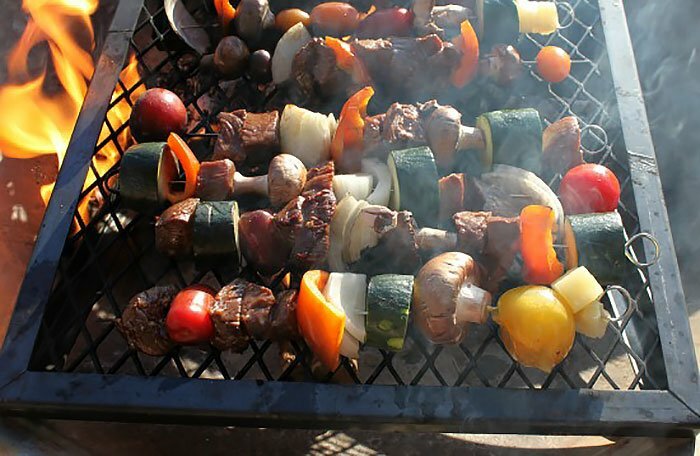 Cook skewers on grate for three to five minutes on each side. Take a piece of beef off the end and cut into it to check if its done. If not, slide it back on and put back on the grill until done.